The fast, easy way to apply preprinted labels to your bottled products and more! Weber offers two tabletop units to efficiently apply pressure-sensitive labels to bottles. 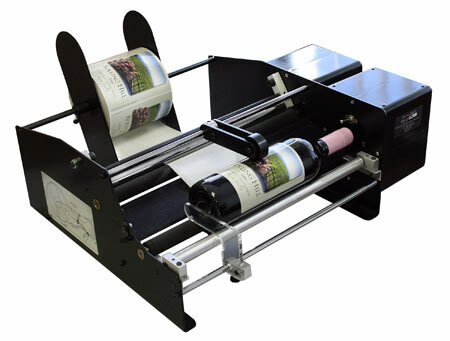 The Bottle-Matic label applicator applies one label per product while the Bottle-Matic II label applicator applies a front and back label to your product. Both units are avilable in either a 10" wide or a 16" wide version for taller products. Two different versions of the Bottle-Matic are available. 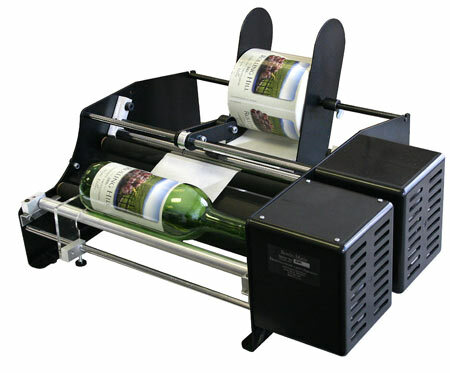 The original Bottle-Matic applies one label per bottle while the Bottle-Matic II applies a front and back label to a bottle or other round cylindrical container. If using the Bottle-Matic II, make sure your label supplier knows to alternate front and back labels on the rolls when printing them. Containers to be labeled should be flat from top to bottom without any thing protruding from the side or top. If you have a container or product with an oversize cap or lid, you can get a specially cut roller for your Bottle-Matic to compensate for this protrusion. Applies a single label to bottles and other cylindrical objects up to 10" in diameter. Applies two labels (front and back) to bottles and other cylindrical objects up to 10" in diameter.